Looking for high search engine rankings?? And wondering What is this html meta tags?? Do you think that your site will be in the first position for your key phrase, if you just add meta tags with your search key phrase ?? Search engine use lot of factors like back links, social network links,page content etc etc to calculate the search result position,in their algorithm and Meta tags are one of them. Meta tags plays an important role in search engine result position and click through ratio. First thing you have understand is that the content is the king. I am creating this article with so much care and spending lot time because with my experience, the content make the article a winner. so first thing you have to concentrate on content, then only meta tags can help you. Meta tags are invincible to users and browsers will not render it. However the search engines, will read it, to understand how to treat the page?? Meta tags tell robots when to revisit, is it allowed to index the page? what is the title of the page, what is the page content etc etc? ?, how to handle the page and the links of in the page? Most important for search engine position and click through, is that title, and Description. The title is shown in search results in bold text and if a user sees an exact title what he searched for, the chances of clicking on your link is very very high. The visitor who come like this way, is highly targeted for your page as he searched for it. Html tags will not be displayed to user. It is purely inserted to pass technical data about the page to the other software or to a search engine which is attempting to index it in to their search result. 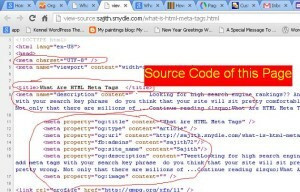 However if you look source code you can see the Meta tags. Meta tags contain lot of element. I will explain The importance of meta tags here. The original title of this article was “html meta tags seo”. But later I have found out “html meta tags seo” is having only 390 exact searches/month, where as “what are Meta Tags” has got 1600 exact searches/month. So I have Changed the title of this page to “what are HTML Meta Tags” so that if it comes in the first page in Google search results for “What are HTML Tags” then I can get around 10 times more readers for this article. I hope you understand the importance of Title in Meta tags. The above tag is Just one meta tag. Each and every meta tag got different roles and importance. Html page got two portion. one is head and other is body <head></head><body></body>. you meta tags should go in between <head> </head>. The head portion normally contain the information for browser and other requester like robots. The Title tag is actually not a meta tag. like other tags it does not tell it is meta tag. It just says <title>., where as meta tags normally starts with <meta name=””>. But as per W3C it is required. It gives the title for the page and when user view you page it gives the name for that page at browser’s top bar. And with my experience meta tag is the one of the most important factor in Search engine optimization. Google shows that in search results as the bold link. And if your title is closely resembles the users search term the chance of users clicking on your result is more. Title tag is also good for getting highly targeted customers if you do a local business. Say if you are selling dogs in Melbourne if you title your pages like “spoodle for sale in melbourne” will get more real customers to you than “spoodle for sale”. Description page tells the search engine what is your page about. Users will not see. But the description should be highly relevant to the page element. Otherwise you may end up in last of the result. This tag shows in search results as excerpt. So you must select the wordings in such way that a searcher will click on your result. If you are selling rice, make sure you are using “buy rice” in the first line of the description so that in search engine results the user who want to buy rice sees buy rice in your excerpt and will understand that you are selling the rice. Example “Looking to buy rice, well we have lot of varieties of rice”. Etc etc. The length of the Meta tag should be logical. Search engines will not show big paragraph of your bla bla under the search results. So make sure that you are using highly targeted keyword phrase which your potential customers are searching. Also try to use the best one in first sentence. Ideally they say the length of meta description length should be less than 155 characters including the spaces. When you search for something and if you see a site with meta description that you are looking for then you will click on that. So the good and relevant meta description will increase the click through and more targeted visitors to your site. There are lot of websites are there to generate the meta tags for users who is not having high html language. However it is not hard to write one meta description. Before long ago the search engine used to look for keywords to match their result. At that time the directory listings was used as search result and they used to match the keyword with search term. However now no search engine looks for keyword. Search engines are stayed away from keywords since lot of people used this meta tag to fool the search engine. They may be selling low quality audio systems but in the keyword they put “Sony”. So a searcher who want to buy a sony audio system may end up reaching a website who sells low quality audio system, thus a bad search experience. Now the search engines have the technology to read your actual page and understand what are you doing. As my recommendation is not to use keyword tag, however if you still looking for keywords then there are meta tag description is available.